Challenges do motivate me, although my results in past attempts at errandonnee have been mixed. The 2018 errandonnee (errand + randonnee) dates, March 20-31, present some difficulties; among other factors I’ll be in Olympia several days for all-day workshops during this time frame. I also don’t usually try to make errands longer. Thus I need to plan if I really intend to check off 12 errands in 12 days in seven of the 10 categories, 30 miles total. Fortunately errandonnee rules permit two uses of any category. I also have a reason to start building mileage; Hubs and I are looking at doing another multi-day bike touring vacation in late May like our awesome trip fall 2017 and I need to build up some mileage. Haircut scheduled for March 21. Getting there can be all bike, or light rail + bike, and getting back to the office will be via bike. A full round trip would knock out seven miles. Say, if I were to schedule a massage with Virginia, who did such a great job on my frozen shoulder…. 4.5 miles for the round trip. You carried WHAT on your bike (or back)?! Going to the garden store for some tomato plants and basil seems like a good one for this. Round trip would be three miles. I’ll hit a museum or art gallery on a lunch hour. Maybe two miles? Good excuse to visit the Bonsai Northwest Museum. Roughly 10 miles for the round trip from home. I could plan this for Saturday March 31 if I need the miles. Hmm, I’ve been meaning to get my King County library card at long last. This would be three miles round trip if I don’t combine it with another category (which would be legal under the rules). I’m overnighting in Olympia with friends so the ride to/from their house counts as social. Six miles right there. Reasonably sure I can find someone to get coffee with for a second run to get additional mileage. Grocery store is two miles away. A couple of runs would net me eight miles. Or maybe I need to go to the yarn store in Burien, which would be a seven-mile round trip. I need to give this one some thought. Initial ideas include getting together with Second Daughter for the photo shoot she gave me as a Christmas gift or going to a political demonstration (which could also fit under Peaceful Everyday Actions). All in all, looks as if I could cover the categories and the mileage. The short trips add up more quickly than I thought. It does mean scheduling my life a bit more deliberately than I usually would, and I’m postponing getting the tomato plants by a week. But I’ve been needing that haircut. And the rules do note that if one of the errands involves pastries, before and after pictures are required. So there’s that. 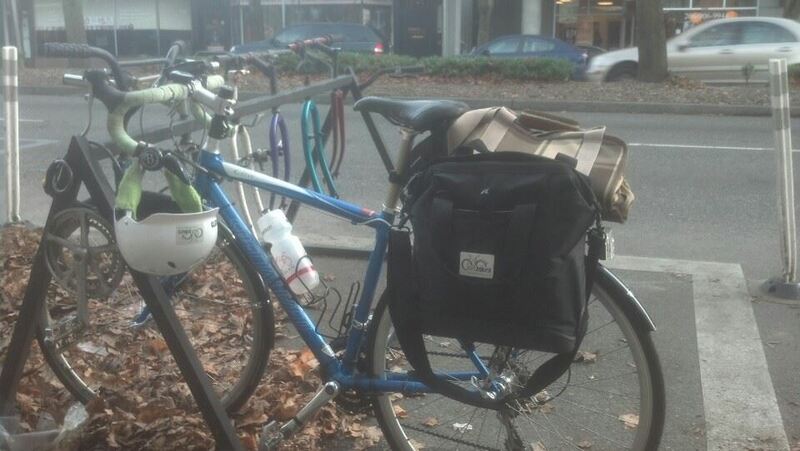 Errandonnee: Winter Errands by Bike!